Next up, a sarcastic and humorous sixteen year old boy, Noah. I like him lots. Seriously. Hello! I am Noah… I am super awesome and hilarious. I was asked to write my post last week and my attempts to make Mom forget worked for a while but now I really have to do it… So here goes! I like homeschooling because it allows me to have closer friendships, homeschool co-ops, more free time, and a more flexible schedule. I don’t like being cooped up in our house for most days, or the fact that if we miss a day of school, we then have to make up for it on Saturday. 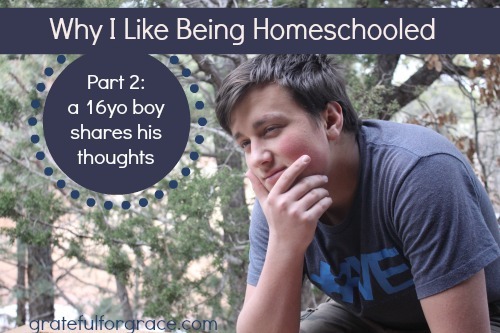 I think many people believe that all homeschoolers aren’t socialized and are boring. While this applies to some homeschoolers it certainly doesn’t apply to us or any other homeschoolers that we know! I think that homeschooling is the better option, but I personally won’t be teaching them, so I won’t force whomever I marry to homeschool my kids. That’s all I got out of this boy first attempt, so there was so conversations and some commands made….. nare I say threats, and I was able to extrapolate a bit more. I usually try to sleep in for as long as possible then, when that fails, I eat breakfast and then clean up the mess made from breakfast, then I get started on the schoolwork I do on the CPU, and by the time that’s done, it’s usually lunch time! (Adding in tossing smaller children on the bed) After lunch is over and cleaned, I start to do the more fun subjects (Logic, Chemistry, and Drama) and then I make sure that I’ve finished everything, then eat dinner and go to sleep. On Fridays my schedule is completely ripped to shreds, due to Co-op in the morning, and Sign Class in the afternoon. Also, on Wednesday I have little time to do normal school in the morning because I have Chemistry right after lunch, and Drama after that until 5 or so. What more do you want people to know about homeschooling and specifically about homeschooling a high school boy? It makes life busier and more fun. Always. Sooooooooooooo that’s me! 😛 talk to you later! I may or may not throttle this sixteen year old boy. Since I said I wouldn’t do this post for him/them, I will leave it. Sigh. Hit him with some … no… many! … questions! What would you like to ask a 16yo homeschooling punk/boy?